In the series of learning C programming, we learned to repeat a set of statements and terminate a repetitive statement using break. Here in this post, I will explain another program flow control statement i.e. continue. We use break keyword to terminate a loop or switch immediately. However in programming, there exists situations when instead of terminating from loop you need to skip some part of the loop and continue to next iteration. For example, consider the situation of sending email to 100 employees. In the process of sending email, for each employee you will perform two operation. First, get email address of employee. Afterwards attempt to send email at his address. Suppose an employee does not have email. In such case, instead of terminating entire email process it is better to skip sending mail to that employee and continue to next employee. For such situations in programming we use continue keyword. 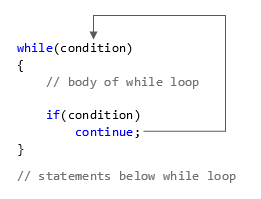 continue is a jump statement used inside loop. It skips loop body and continues to next iteration. continue statement on execution immediately transfers program control from loop body to next part of the loop. It works opposite of break statement. In case of nested loops, it continues to nearest loop. Rules to use continue statement in C programming. You must use continue keyword inside a loop. Use of continue outside loop will result in compilation error. continue is not used with switch...case statement. In case of nested loop, continue will continue next iteration of nearest loop. Do not confuse that continue transfer program control to loop condition. It transfer program control to next part of the loop. Use of continue statement without condition is worthless. Hence it is often used with if statements. continue statement skips loop body and continues to next iteration. Below are some working examples of continue statement. How continue statement works with for loop. 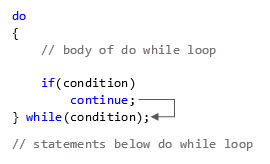 How continue statement works with while loop. How continue statement works with do...while loop. Let us write a C program to print all even numbers from 1 to 100. Printing even number is easy however, for this program I will make use of continue statement. 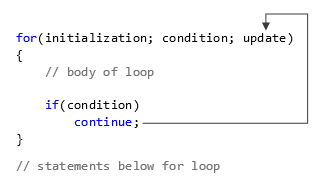 Initially for loop initialization receives program control. It initializes num = 1 and transfer program control to loop condition. 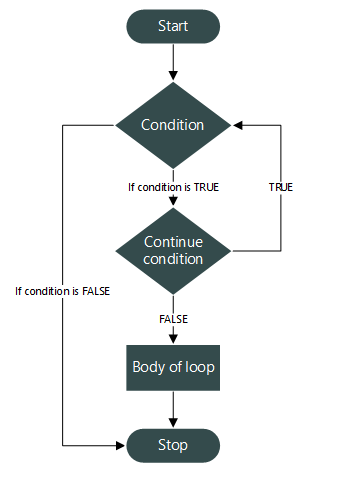 Loop condition checks if num<=100 then transfer program control to loop body otherwise terminate from loop. For num=1 the condition is true hence transfers program control to loop body. Inside loop body I am checking odd condition i.e. if a number is not divisible by 2 then it is odd. Since we only need to print even numbers. Hence, if the above condition is met then skip rest loop body and continue to next iteration. For num=1 the condition (num % 2 == 1) is true hence, continue is executed which skips rest of the loop body and continues to next iteration. For num=2 or any other even number the condition (num % 2 == 1) is false hence, printf("%d ", num); is executed printing the even number.